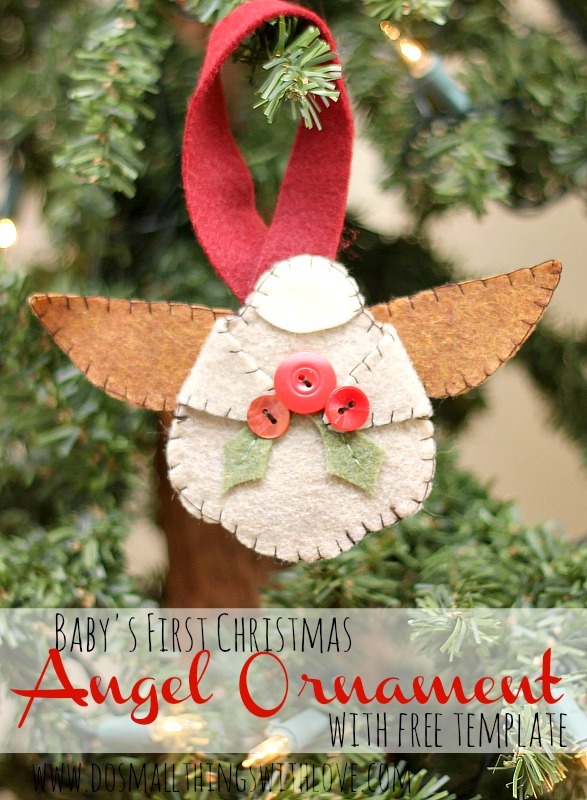 Today I am excited to be sharing this adorable Felt Angel Ornament I made to celebrate a baby’s first Christmas. This is a project that ANYONE can create, with the template I’ve provided. I know, I know. It’s only the beginning of November and we still have to celebrate Thanksgiving, but I am starting in on the Christmas projects. Why? Because, as you know, most of my projects involve hand-stitching, and hand stitching takes time. So, in case you are looking for a few fun, sweet Christmas crafts, I’m going to try to get somethings posted so that you have time to recreate them, if you are so moved. Last Christmas my family has the privilege of celebrating 3 babies’ first Christmas. This means that I had the joy of being pregnant at the same time as my sister Ruth and my sister Maria! My niece Rose was born in May, my nephew Patrick was born last week, and my own little baby was born last year in November. And, to top things off, my sister Ruth had another baby this year, Luke, born just a few days ago. So, last year I made these cute baby’s first Christmas ornament–but then got wrapped up with the birth of my own baby, and never shared them. I was especially motivated to do this for my dear nephew Patrick who survived an incredibly traumatic birth. Amazing! Use template provided to cut out 2 angel bodies (one with arms folded out, one with arms folded in), and wings. The head and holly leaves can easily be free-hand cut. Pin angel body without arms on top of angel body with arms. Pin head on top of both. Blanket stitch around the outside. As you blanket stitch, make sure to stitch down the head as you go. Fold in arms. Pin down and stitch buttons on so that they will hold down the arms. Blanket stitch around the outside of the wings. Stitch the wings to the back of the angel body. 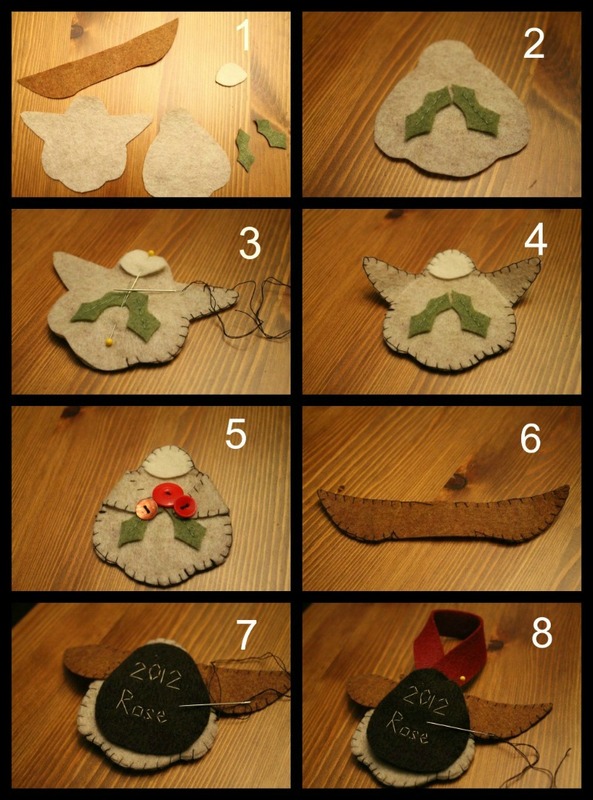 Then, take a scrap piece of felt and add personalization. Cut a strip of felt to be used as a loop at the top. Pin in place. When this is done, whip stitch the piece of felt with personalization to the back, making sure to sew down the loop as you go. And there you have it! 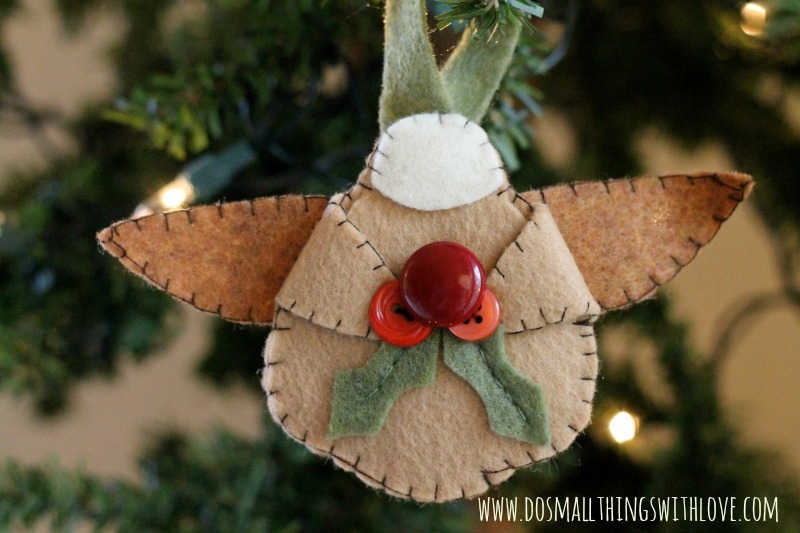 A cute, cheep way to mark a babies 1st Christmas! The template does not appear for printing. Cute idea. I would like to make it. Thank you.